From left: Bernice Espinosa-Torres, Committee Clerk, House Committee on Energy Resources, and Rep. Terry Canales, D-Edinburg. Forged search warrants, which were used by the now-disgraced and defunct Panama Unit anti-narcotics law enforcement task force to threaten the innocent in Hidalgo County, would be more difficult to counterfeit under legislation pre-filed on Friday, January 9, by Rep. Terry Canales, D-Edinburg. The Panama Unit – created in 2010 and disbanded in January 2013 – was made up of a small group of area law enforcement officers who wound up breaking the law themselves by stealing from, or working with, drug dealers. 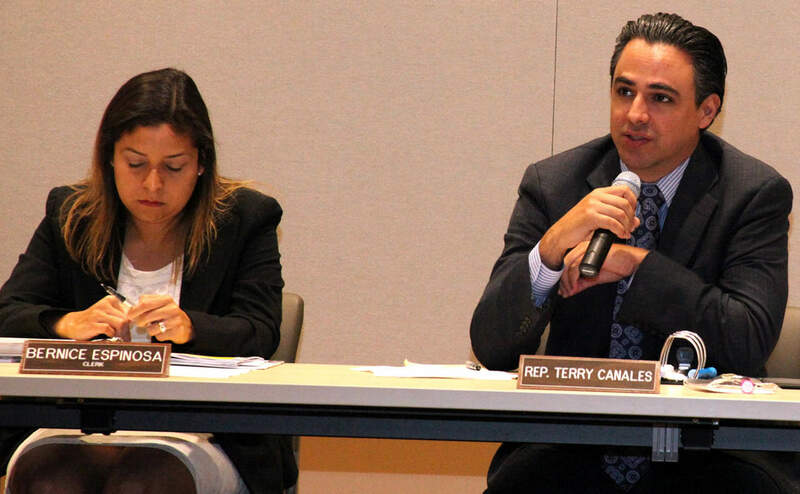 Canales’ House Bill 644 seeks to close what he contends is a potential legal weakness in the search warrant process, which was prompted by the infamous Panama Unit law enforcement scandal. The House District 40 lawmaker’s HB 644 requires that the name of the judge or magistrate, who are authorized to issue search warrants, must be typewritten on that powerful legal document. “Currently, a search warrant requires a judge or magistrate to sign their name on it, but many people have signatures which are too difficult to make out,” explained Canales, who is a lawyer. The Panama Unit would just scribble names on search warrants, making it difficult to verify because no one could read the judge’s supposed signature. “If our bill would have been a law already, we might have caught the Panama Unit much sooner,” Canales said. The second-term lawmaker added: “The actions of the Panama Unit, whose members have been convicted of their crimes, painted a very unfair and negative image of our law enforcement professionals in Hidalgo County. But this tragic episode shed light on a weakness in the search warrant process, and by passing this measure, a very important improvement can be made in the name of justice and civil liberties.” The plan is being supported by the Texas Municipal Police Association, the largest law enforcement association in Texas, which represents more than 21,000 local, county and state law enforcement officers. 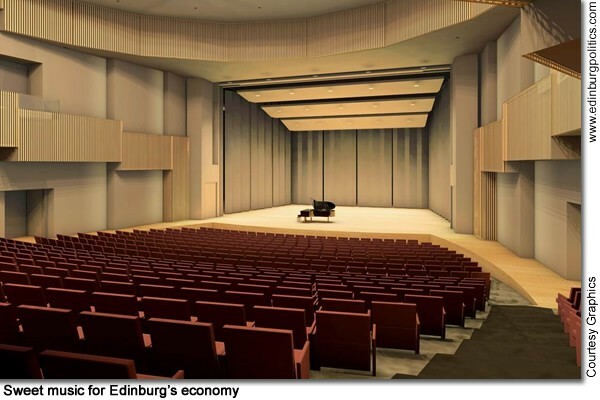 The University of Texas System Board of Regents on Thursday, August 25, gave final approval for the construction of a $42.6 million, 1,000-seat performance arts center at the UT-Pan American – a highly-anticipated decision that has been long in coming. But it comes just in time for the Edinburg City Council’s and Edinburg Economic Development Corporation’s planned and dramatic transformation of the community’s vital downtown and university corridors, says Mayor Richard García. “This is excellent timing because in a few months, we will be soliciting public bids from qualified firms for our planned make-over of West McIntyre Street into a beautiful, pedestrian-friendly, environmentally-enhanced corridor that will help existing businesses and attract new shops and venues to serve thousands of residents and visitors who will come to our downtown and university” said the mayor. Sen. Juan “Chuy” Hinojosa, D-McAllen, a principal legislative architect in helping secure state funding for the complex, emphasized the positive impact of the approved project. “This facility will attract supporters of the arts, quality performers and outside visitors. These benefits will also radiate into the community in other ways,” said Hinojosa. “I am confident this will be a top-notch performing arts center that will bolster the local economy by attracting jobs and investment, and enrich the cultural life of the Rio Grande Valley. Investments like these are particularly beneficial because they help boost UT-Pan American’s profile in the region.” See story later in this posting. With several members of his immediate family looking on, local healthcare and produce businessman T.C. Betancourt on Monday, August 23, officially announced his candidacy as a Democrat for state representative, House District 41, which includes southwest Edinburg. He noted that Republicans, who control the Texas Legislature, approved state budget cuts and legislative redistricting plans last spring that cost South Texas billions of dollars in critical funding over the next several years. “I intend to work hard to create good-paying jobs, affordable healthcare and offer more people the ability to access the education they want,” Betancourt said. “These are the opportunities and benefits that I have provided our employees and families in Hidalgo County for the past decade. I can be trusted to fight for the people of South Texas.” Featured with him, from left, are his wife, Ana, formerly of Mission, and his parents, Mary and Lupe Betancourt. T.C. and Ana Betancourt have twin sons – Aiden and Tristán, and he has two brothers – Lupe III and Joel – and one sister, Candy Martínez. See story later in this posting. 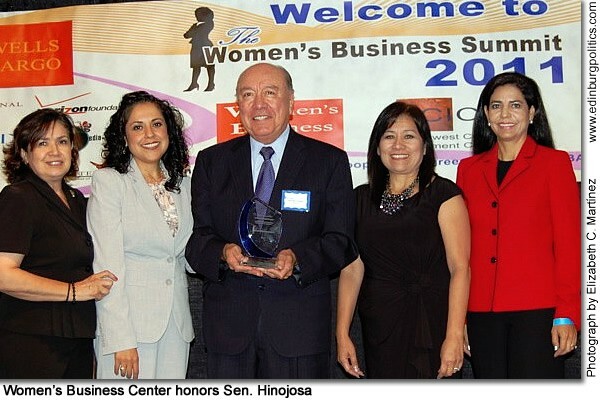 The Women’s Business Center honored Senator Juan “Chuy” Hinojosa with the “Community Advocacy Award” on Friday, August 26, at the 2nd Annual Women’s Business Summit held at Texas State Technical College in Harlingen. Hinojosa was honored for being an outstanding community leader and for his dedication to improving the lives of women. “My hat goes off to women, because I know that women work much harder than men do,” Hinojosa said. María “Charo” Mann, executive director of the WBC, said “Sen. Hinojosa has been an outstanding supporter of woman issues here in the Rio Grande Valley and fought the good fight during this past legislative session. We are very honored to have such a leader among us.” The Women’s Business Summit was a day-long event providing useful information to business professionals, entrepreneurs, and aspiring business owners. The event’s theme was “Creating Strategies for Today’s Successful Woman” and topics such as Access to Capital, Marketing, Productivity and Leadership motivated attendees. For more information about the Women’s Business Center, visit http://www.wbc-rgv.org. Featured, from left: Sylvia Zamponi, Lower Rio Grande Valley SBA district director; Catalina Madrigal-Rupert, TXU Energy community relations manager; Sen. Juan “Chuy” Hinojosa, D-McAllen; María “Charo” Mann, Women’s Business Center executive director; and Alma Ortega-Johnson, Wells Fargo Upper Valley president. All aboard! Get on track with the Edinburg Chamber of Commerce Depot Restoration committee and efforts to preserve the historic train depot, located at 602 W. University Drive. The Hobo Hap’nin Reunion will bring to life one of the most successful events and fundraisers that brought the community together for one common purpose. The event is scheduled for Saturday, September 17, starting at 6:30 p.m. filled with live entertainment, live and blackboard auctions and a scrumptious dinner. Featured promoting ticket sales to the Hobo Hap’nin Reunion are members of the 2011-2012 Depot Restoration Committee. From left are: Letty González; Elva Jackson Garza; Flo Prater; Maggie Kent; Marty Martin; Edna Peña; and Vivian Martin. The Texas Association of Mexican American Chambers of Commerce (TAMACC) held their annual convention in Irving August 25 through August 27. The Rio Grande Valley Hispanic Chamber of Commerce, headquartered in McAllen, was honored as the Medium Chamber of the Year. 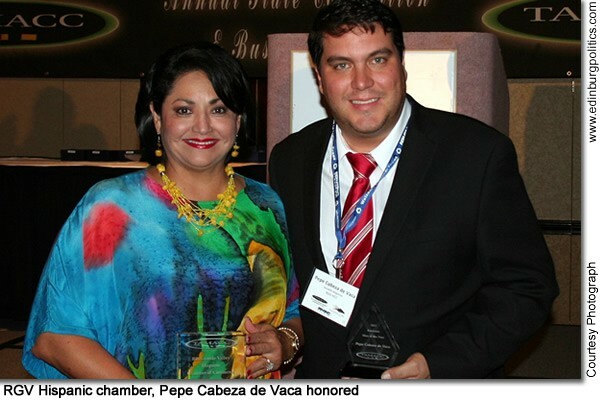 In addition, Pepe Cabeza de Vaca, publisher of Socialife magazine, was honored as the Business Man of the Year. The awards were given out at the annual Chairman’s Gala on August 26. The RGV Hispanic Chamber was recognized for their work on issues that impact small business, education, legislative affairs, women, and health. It was noted that the RGVHCC had also extended their services to the entire Rio Grande Valley. This makes the 10th award in the past 12 years from the Texas State Chamber that the RGVHCC has received. “We are extremely proud to be able to represent the Rio Grande Valley. Due to the economic hardships, it has been hard at times to put forth our program of work, but our dedication to our membership is what has kept us going,” said Cynthia M. Sakulenzki, president and CEO of the RGV Hispanic Chamber. Cabeza de Vaca, who also is a member of the RGVHCC, was publicly recognized for successfully guiding his publishing interests, which now are circulated in Starr County as well as Hidalgo County, plus he has added health and kids social magazines. “We are extremely proud that a member of our chamber would be honored with such an honor,” Sakulenzki emphasized. Rep. Aaron Peña, R-Edinburg, and Rep. Verónica Gonzáles, D-McAllen, whose legislative districts include Edinburg, are noting the economic influence of the performance arts complex, whose auditorium is featured in this rendition, and other upcoming academic and physical improvements to the largest state university south of San Antonio. 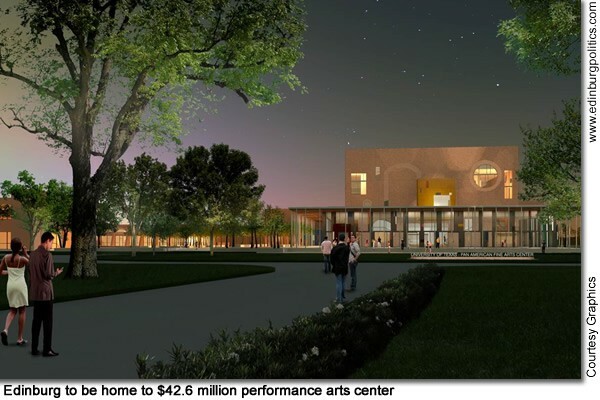 “The completion of the fine arts center and the other major investments by the UT System are going to have a deep and lasting impact in our community,” said Peña. “Young people interested in pursuing careers in medicine, science, technology and the arts will have some wonderful tools at their disposal.” Peña was the coauthor of House Bill 153, supported by the Valley state legislative delegation, that included hte funding for the facility. “Good things come to those who wait,” Gonzáles said. “It took a while for monies we secured years ago to fund this project to become a reality, but it will definitely be worth the wait. UTPA is one of the finest educational institutions in this state and it deserves a top-of-the-line Fine Arts Center. The benefits it will bring not only to students, but to all our community will be endless.” See lead story later in this posting. Earlier this month, Lt. 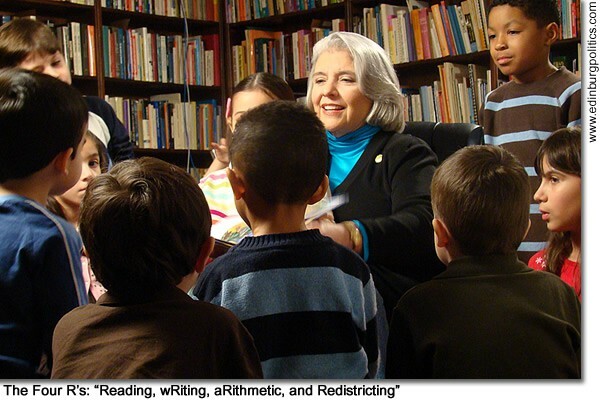 Governor David Dewhurst appointed Sen. Judith Zaffirini, D-Laredo, featured here reading to elementary school students, to the Select Committee on Redistricting. In her guest column, featured later in this posting, Zaffirini explains how the upcoming congressional redistricting battles in the Texas Legislature next spring will have a major impact on how much federal money comes for public school education. Zaffirini says South Texans can help funnel more federal funds for local school districts by fully participating in the final rounds of the U.S. Census. "An accurate census count is critical to fair representation for all Texans. Congressional seats are awarded to states based on population, and regions of Texas with greater population are given greater representation in the state legislature and board of education," she contends. "Census counts also will play a major role in determining how $4 trillion in federal funds will be spent over the next decade for critical needs including roads, hospitals, school lunch programs and senior centers." 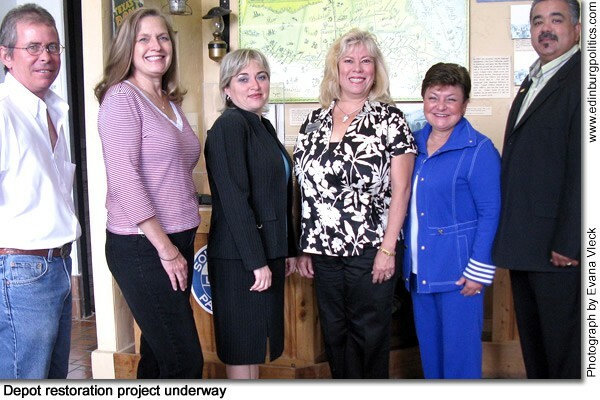 The Edinburg Chamber of Commerce Restoration Committee has undertaken the task of preserving the Southern Pacific Train Depot, a historic site constructed in 1927 that has served the community and the Valley for many decades, including housing the local chamber and the Edinburg Economic Development Corporation. The facility was presented with a historical designation by the Texas Historical Commission once the initial restoration project was completed in 1995. Volunteers of the Edinburg Chamber of Commerce Depot Restoration Committee, members of the Board of Directors and Chamber staff have united to restore one of the city’s jewels. Committee members gathered recently to plan the next phase of the ongoing restoration project. 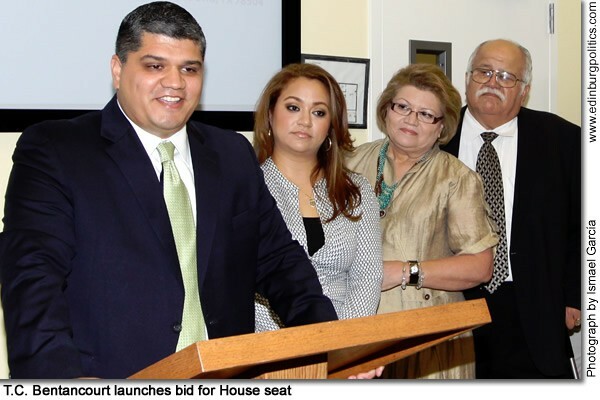 Featured, from left: Marty Martin, Rio Valley Realty; Flo Prater, Rio Valley Realty; Letty González, President of the Edinburg Chamber of Commerce; Elva Jackson Garza, Depot Restoration Committee Chair; Maggie Kent, General Dentistry Centers; and Johnny Rodríguez, Austin Personnel Services and Chairman-Elect of the Edinburg Chamber of Commerce. See story later in this posting. On Tuesday, July 13, the Workforce Solutions (WFS)Board of Directors recognized Cellular One for their continued support and creation of jobs in South Texas by presenting the telecommunications company with an Employer Partnership Award. 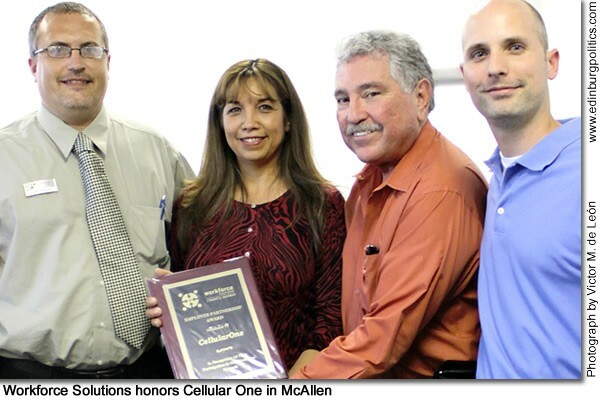 In April 2008, Cellular One approached WFS with the idea of creation a call center in McAllen – their first in Texas. With an initial staff of 20 employees, the Cellular One call center now employes 79 staff members – who also receive excellent benefits packages – which were referred by WFS. Featured, from left: John Hershey, Workforce Solutions; Rosie Welborn, Cellular One; Sam Vale, Workforce Solutions Board Chairman; and Ryan Murphy, Cellular One. Alexander Cantú, a graduate of Edinburg North High School, was one of four Edinburg area students who were recently honored for their academic achievements with public recognition and scholarships by the Edinburg Chamber of Commerce Ambassadors Committee. The Ambassadors Committee last month held the 1st Annual Night Golf Tournament, which raised $4,000 for scholarship funds for Cantú and three other worthy students: Evan Brough, a graduate of the South Texas BETA Academy; Alexis García, a graduate of Edinburg High School; and Christian Henry, a graduate of Johnny G. Economedes High School. Those funds also were used for a restoration project for the Edinburg Depot, which currently houses the chamber of commerce and the Edinburg Economic Development Corporation. Featured with Cantú is Celeste Cabrera, a Chamber Ambassador, who also co-chaired the Night Golf Tournament. 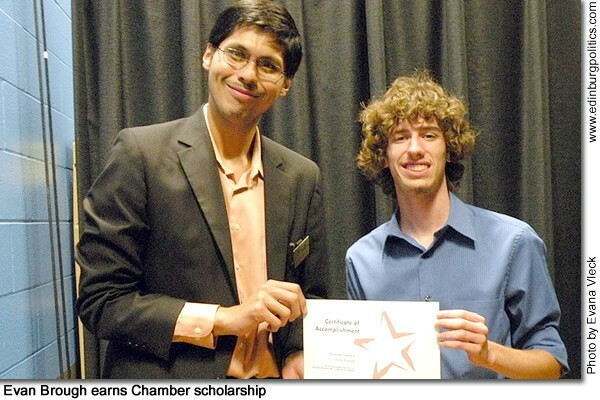 Evan Brough, a graduate of the South Texas BETA Academy, featured right, proudly accepts his Certificate of Accomplishment, which also brought an academic scholarship, during a recent ceremony hosted by the Edinburg Chamber of Commerce. Bough, shown here receiving the public recognition from Martín Rivas, Director of Membership for the local chamber, was one of four Edinburg high school graduates who were awarded scholarships from proceeds of a June 11 golf tournament hosted by the chamber. In addition to Brough, the other accomplished area high school graduates who were honored and bestowed with scholarships were: Alexander Cantú, a graduate of Edinburg North High School; Alexis García, a graduate of Edinburg High School; and Christian Henry, a graduate of Johnny G. Economedes High School. The golf tournament, held on Friday, June 11 at the Ebony Municipal Golf Course, fielded teams whose entry fees help raise the crucial funds for the scholarships and the renovation work. From that competition, the follow teams placed accordingly: 1st Place: Jerry Salazar, Eric Cubriel, Víctor Prado, and Adolfo Cubriel; 2nd Place: Albert Ochoa, Chris Brasher, Eloy Alberete, and Mike Salinas; and 3rd Place: Guy Marroquín, Justin Esparza, and Rey Chavana. 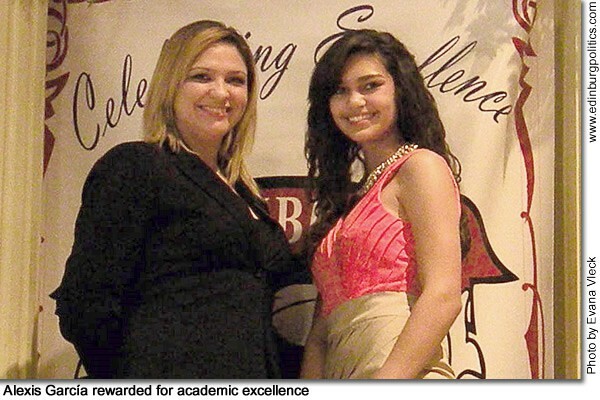 Alexis García, featured right, a graduate of Edinburg High School, poses with Celeste Cabrera, a member of the Edinburg Chamber of Commerce Ambassadors Committee, after being honored by that group for the EHS student’s achievements in school, a ceremony which included García receiving a scholarship from the Ambassadors Committee. In addition to García, the other accomplished area high school graduates who were honored and bestowed with scholarships were: Evan Brough, a graduate of the South Texas BETA Academy; Alexander Cantú, a graduate of Edinburg North High School; and Christian Henry, a graduate of Johnny G. Economedes High School. The Ambassadors Committee also expressed their appreciation to the following sponsors for their commitment and support for: Allure Marketing Firm; Berton Auto Industrial; Beyamar Home Health & Hospice; Briggs Equipment; Budweiser; Convention + Expo Management Services LLC; Edinburg International Race Track; Edinburg Road Runners; Elsa State Bank; Gilbert Enríquez Enterprises; H20 Only; Home Depot Store #516; Klean Kits; Law Office of Roy Valdéz; ING/Rolando J. Guerra & Associates; Magic Valley Electric; Melden & Hunt; Lowes; Pro Nails II; Ramón’s BBQ; Rescue EMS; Sandia Depot; Security Depot; Stepping Stones Rehabilitation; Tiger Rock Taekwondo; and Valley Grande Manor. 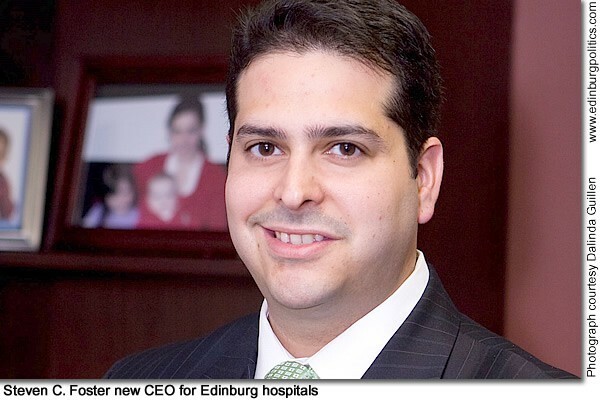 South Texas Health System has recently named Steven C. Foster as Chief Operating Officer for Edinburg Regional Medical Center and Edinburg Children’s Hospital. “I am pleased to announce the promotion of Steven Foster to the position of Chief Operating Officer at Edinburg Regional Medical Center and Edinburg Children’s Hospital,” said Douglas Matney, Vice President of the Acute Care Division and Group Director for South Texas Health System. “We extend congratulations to Steven on his promotion and wish him continued success.” As Chief Operating Officer, Foster will help lead Edinburg Regional Medical Center and Edinburg Children’s Hospital’s strategic, operational, and administrative activities with Linda Resendez, RN, CEO. See story later in this posting. 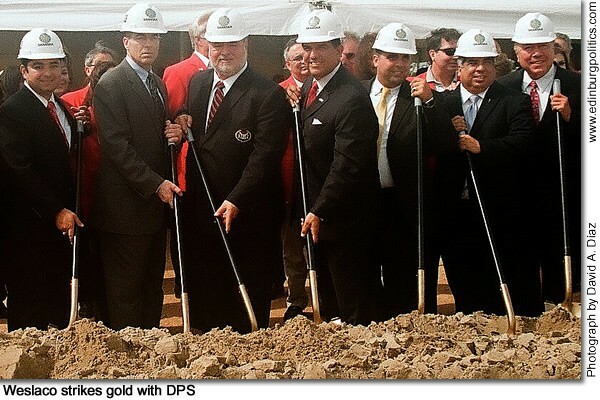 With shovel blades and even the overturned earth bearing a gold coloring, Valley legislators literally and figuratively hit pay dirt in Weslaco on Friday, May 14, during the groundbreaking ceremony for the planned $40 million Department of Public Safety Regional Headquarters. The complex will feature about 110,00 square feet and accommodate 212 employees, who will serve and protect area residents as a regional state public safety command center – including housing the Highway Patrol, Texas Rangers, and aircraft – plus focus on criminal investigations, intelligence and counter-terrorism, crime laboratory, communications, and emergency management. In addition, the complex will include a driver’s license facility, victim services, information technology, and agency support. It is expected to open for business by the summer of 2011. In 2007, the Texas Legislature, led by the Valley legislative delegation, authorized the funding for the construction of the facility, which will serve Hidalgo County. The Weslaco Economic Development Corporation, directed by Hernan Gonzalez, donated the 21-acre tract of land, which is located at the corner of FM 1015 and Sugar Cane Drive (Mile 9). Featured, from left: Rep.-elect J.M. Lozano, D-Kingsville; Steven C. McCraw, Director of the Texas Department of Public Safety; Weslaco Mayor Buddy De la Rosa; Sen. Eddie Lucio, Jr., D-Brownsville; Rep. Armando "Mando" Martínez, D-Weslaco; Rep. Aaron Peña, D-Edinburg; and Sen. Juan "Chuy" Hinojosa, D-McAllen. 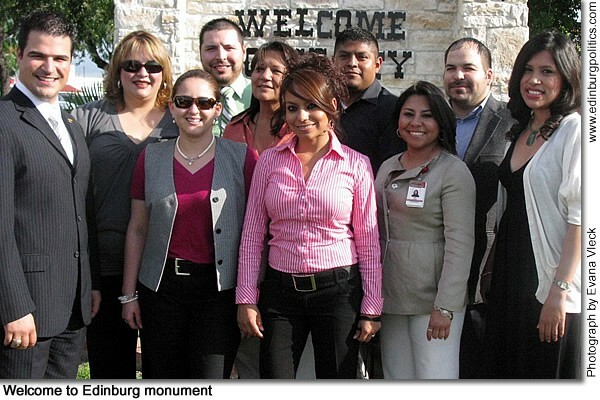 Leadership Edinburg Class XXI on April 19 held a ribbon-cutting ceremony for one of its projects, a "Welcome to the City of Edinburg" monument located on the town square at the corner of McIntyre and Closner. The group, which is growing organization that strives to encourage a better Edinburg through strong leadership skills focusing on politics, education, quality of life, and more, has more than 450 graduates. Graduates of Leadership Edinburg typically continue to apply what they learned and demonstrate it by showing interest in community involvement including serving on committees and at times politics. Residents interested in participating in the next Leadership Edinburg Class may contact Letty González at 956/383-4974. Featured, from left: Emilio Santos; Lisa Chávez; Sal Martínez; María Medina; Abel Vaquera; Juan Uribe; and Maris Aguirre. Front row, from left: Myra L. Ayala-Garza; Jensid Álvarez; and Rita Flores. Edinburg’s "Market Day", a planned monthly service of the Edinburg Chamber of Commerce and the Edinburg Convention and Visitors Bureau, will begin on Saturday, June 5, with the inaugural event to be held at the Town Square from 8 a.m. to 4 p.m. Market Day – scheduled for the first Saturday of every month – is designed to help revitalize businesses in that key section of the city, assist small entrepreneurs, and provide family entertainment, according to Edna Peña, a "Market Day" committee member who also serves on the local chamber’s board of directors. "Market Day" will be free to the public, who will be able to purchase various items that will be offered by area vendors. Business owners who wish to sell their products and services during "Market Day" may set up a booth for a $25 fee. For more information, residents and prospective vendors may contact the local chamber at 956/383-4974 or by logging on at http://www.Edinburg.com. 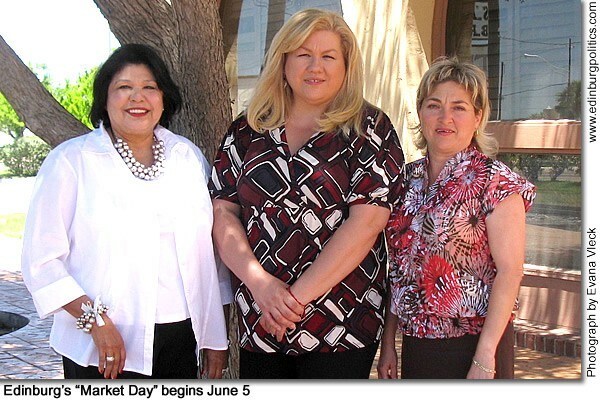 Featured, from left: Edna Peña; Imelda Rodríguez, Director of Tourism of the Edinburg Chamber of Commerce; and Letty González, President of the Edinburg Chamber of Commerce. 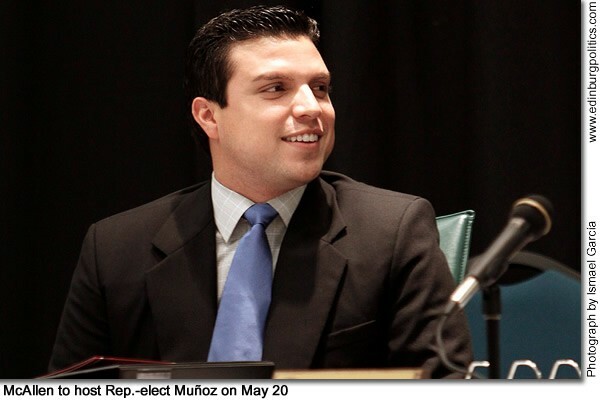 The City of McAllen, McAllen Chamber of Commerce, and McAllen Economic Development Corporation on Thursday, May 20, will be hosting a reception to allow constituents to meet Rep.-elect Sergio Muñoz, Jr., D-Mission. The event, scheduled from 5:30 p.m. to 7:30 p.m. at the McAllen Chamber of Commerce, will be conducted in a casual and informal setting. Muñoz, an area attorney and Palmview Municipal Court Judge, faces no opponent in the November general election for the two-year term, paving the way for him to be sworn into the Texas Legislature when it convenes in mid-January for its five-month regular session. An RSVP is required, so area constituents are being asked to confirm their attendance by contacting Michelle Rodriguez with the local chamber by e-mail at mrodriguez@mcallenchamber.com or at (956) 682-2871. In addition to hearing from residents on legislative issues important to them, the gathering also will allow Muñoz to share his vision for House District 36, which includes Granjeno, Hidalgo, southern McAllen, most of Mission, Palmview, Peñitas, and Pharr. 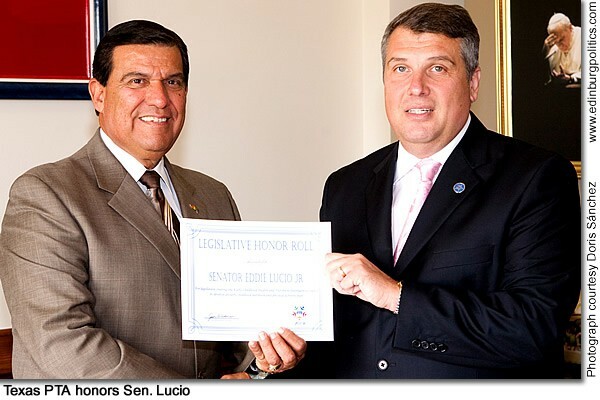 On Tuesday, May 11, Sen. Eddie Lucio, Jr., D-Brownsville (featured left), was presented a certificate in his Capitol office naming him to the Texas PTA Legislative Honor Roll by for his work during the 81st Legislative Session in 2009 to improve nutrition in public schools and address the childhood obesity epidemic. Lucio passed legislation that created the Early Childhood Health and Nutrition Interagency Council to develop an early childhood nutrition and physical activity plan. "Texas PTA applauds Sen. Lucio’s efforts to improve the health status of all Texas children," said Texas PTA President Sharon Goldblatt. "He was also honored for recognizing that students’ academic progress is directly tied to their physical health.” Presenting the honor to Sen. Lucio is Kyle Ward, executive director for Texas PTA. See story later in this posting. Investing more state resources into helping border law enforcement agencies to crack down on the flow of guns, ammunition, stolen vehicles, and even criminal fugitives across the Texas border region’s international bridges into Mexico deserves a close look, says Rep. Armando "Mando" Martínez, D-Weslaco, featured right. That approach was proposed by McAllen Police Chief Victor Rodríguez – and endorsed by McAllen Mayor Richard Cortéz – on Thursday, April 30, during a major legislative public hearing in McAllen by the House Committee on Border and Governmental Affairs and the House Committee on Public Safety. 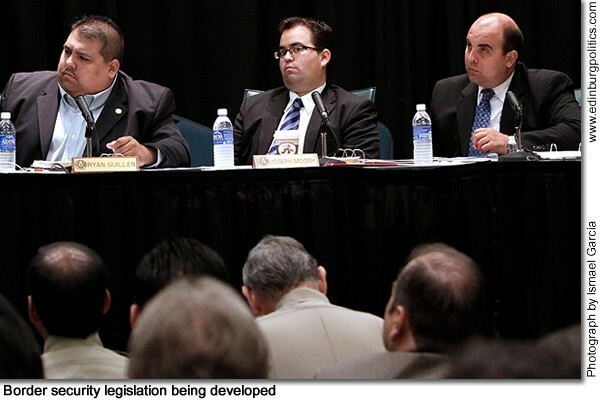 Martínez was one of more than a dozen state lawmakers who heard day-long testimony from a wide range of law enforcement, political, economic development, and community leaders who gathered at the McAllen Convention Center to discuss the threat of border violence spill-over from the ongoing battles in Mexico between Mexican military forces and criminal drug cartels. "With so much attention being placed on the importance of the Texas border region because we are a key economic asset to Texas, we have the opportunity to invest more state and federal funds for law enforcement and public safety in our area," said Martínez. "Many important ideas came out of this legislative hearing, none more important, in my opinion, than what was proposed by McAllen." Featured, from left: Rep. Ryan Guillen, D-Rio Grande City; Rep. Joseph E. Moody, D-El Paso; and Rep. Armando "Mando" Martínez. See lead story later in this posting. 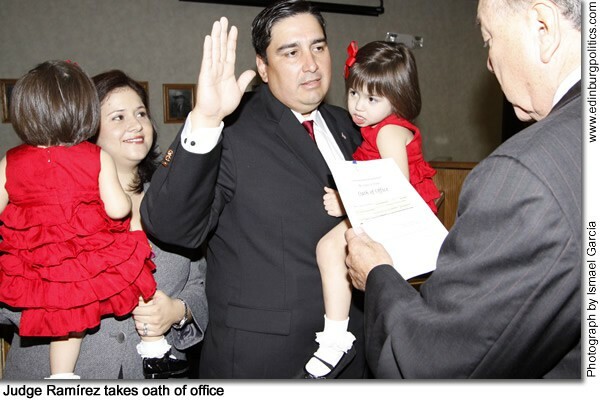 René A. Ramírez of Edinburg on Tuesday, November 3, took the oath of office given to him by his former employer, Sen. Juan “Chuy” Hinojosa, D-McAllen, to become the newest addition to the Hidalgo County family. Ramírez, 40, assumes the role of chief administrator for the sixth largest county in the state after Hidalgo County Judge J.D. Salinas III resigned the judgeship, after nearly three years of dedicated service, for an appointment in the Obama Administration. A packed house in the Hidalgo County Commissioners Courtroom in Edinburg showed up to witness the event, including his wife, Laura Guerra Ramírez, and their two daughters, Gabriela and Mía Carmen. See story later in this posting. 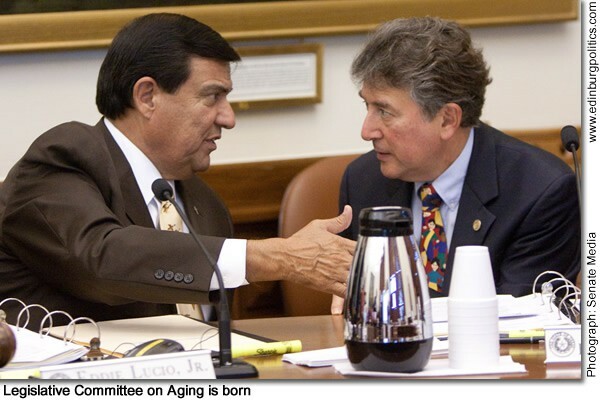 On Thursday, October 29, Sen. Eddie Lucio, Jr., D-Brownsville, featured left, convened the first hearing of the Legislative Committee on Aging, which was established to study pertinent issues affecting the state’s aging population. "Our goal is to examine essential services, such as housing, transportation and health care specific to Texas’ aging population and determine how to better address those unmet needs," said Lucio, who was appointed chair of the committee by Lt. Gov. David Dewhurst. "We want to ensure the state is better prepared to accommodate a growing senior population." Shown with Lucio is Rep. Elliott Naishtat, D-Austin, the House author of the bill that created the committee. The Senate sponsor was Sen. Leticia Van de Putte, D-San Antonio. See story later in this posting. The Edinburg Chamber of Commerce on Wednesday, November 18, will host a Power Punch @ Lunch sponsored by Doctors Hospital at Renaissance and the Children’s Center at Renaissance. The free luncheon will take place from 11:30 a.m. to 1 p.m. at The Depot, 602 W. University Drive. All area residents are welcome to join the social-networking luncheon that will include food, door prizes and fun. To RSVP for the free event, interested residents may call 956/383-4974. 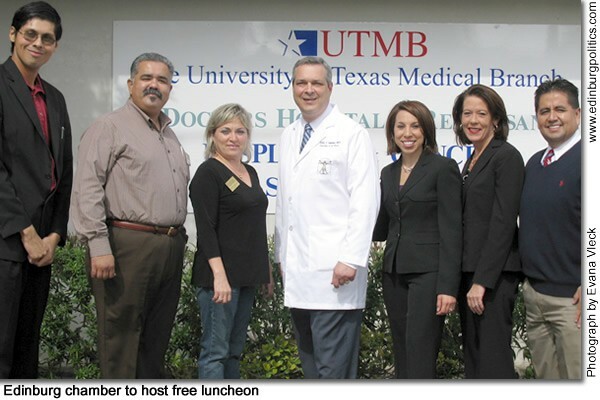 Promoting the upcoming lunch are, from left: Martín Rivas: chamber membership director; Johnny Rodríguez, chamber chair-elect; Letty González, chamber president; Dr. Carlos Cárdenas, DHR chairman of the board; Marissa Castañeda, DHR chief operations officer;Susan Turley, DHR chief financial officer; and Mario Lizcano, DHR marketing director. The Leadership Edinburg Class XXI has announced plans to hold on fundraiser on Saturday, November 21, from 8 a.m. to 1 p.m., as part of its efforts to promote strong leadership skills that focus on politics, education, and quality of life issues. The event will be held at the Edinburg Municipal Park Pavilion, 714 South Raul Longoria Road. 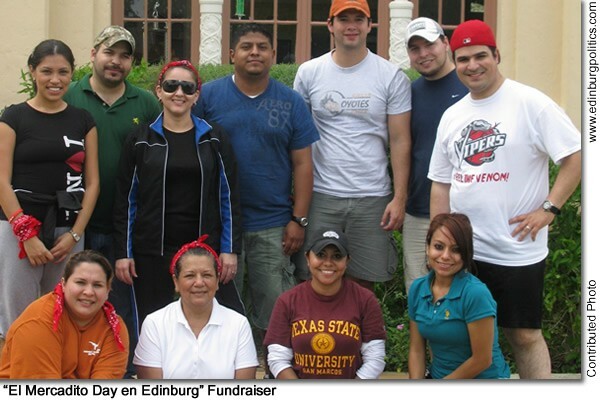 The event, dubbed "El Marcadito Day en Edinburg", helps generate funds for Leadership Class programs through the sale of sponsorships for that gathering. For a fee of $25, area business owners will be assigned one table and two chairs from which to promote their products and services. 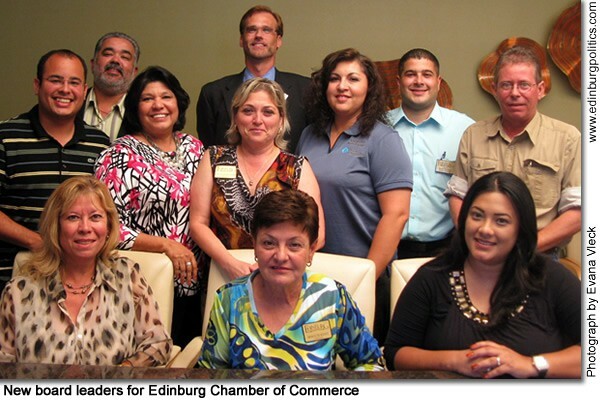 Leadership Edinburg Class XXI participants are currently seeking vendors from all cities. Items which may be sold by the participating vendors will feature, but not be limited to, arts/crafts, jewelry, accessories, clothing, appliances, and recreational items. Featured promoting the fundraiser are, standing, from left: Maris Aguirre, Juan Uribe, Myra L. Ayala Garza, Abel Vaquera, Agustín Hernández, Sal Martínez, and Emilio Santos. Seated, from left: Lisa Chávez, María Medina, Rita Flores, and Jensid Álvarez. For more information please contact Maris Aguirre at 388-8202 or 562-6298 or Myra L. Ayala Garza at 388-1851 or 607-6079.